The S&P 500 broke the psychological 2,600 level and closed at a lower low, setting the stage for a possible retest of a new range above the 2018 low of 2,532. One strategist said the new testing ground could be 2,530 to 2,550, the low end of which is 3 percent below current levels. The Fed meets in the week ahead, and strategists are watching how the market trades after that meeting, which could be a pivotal event for the market. Traders work on the floor of the New York Stock Exchange (NYSE) on November 28, 2018 in New York City. 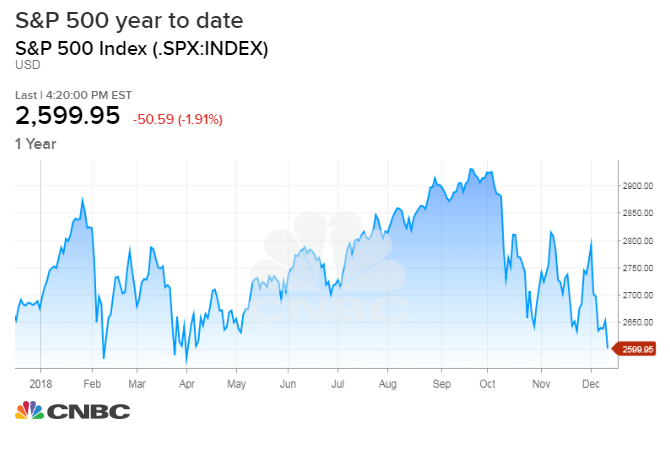 The S&P 500 could be getting ready to test a new range around the lows of the year that it reached in February — a level that is as much as 3 percent below current levels. The S&P 500 closed at 2,599 Friday, below the psychological 2,600 level and the October low of 2,603. The S&P fell below 2,600 earlier this week but did not close below it until Friday. Scott Redler, a partner with T3Live.com, said traders are now watching the range between 2,530 and 2,550. The intra-day low from February was 2,532. The Fed meeting in the coming week could be a pivotal point for the market. The Fed is expected to raise rates but it is also expected to lower its forecast for additional rate hikes and emphasize it will move cautiously. "I think traders are waiting for the Fed on Wednesday but they're waiting to see the action in the first few days of next week. If momentum remains negative, and we trade well below 2,600, we could see a test of the 2530, 2550 February low," Redler said. He added the Fed could be a positive catalyst helping the market find a short term bottom into the end of the year. "The question is where will that short term bottom be," he said. Robert Sluymer, technical strategist at Fundstrat, said he is more concerned about how the market navigates the whole range of lows from this year. "I think it''s deeply oversold...More important than the Friday close is how the market reacts to the Fed next week," he said. "There's an intraday low at May at 2,600. We're basically testing the April lows. ..I think we're down into a range and testing it." The S&P 500 has also been forming a head and shoulders pattern, considered a negative sign for the market.